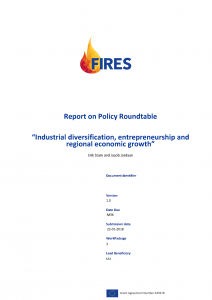 On January 26th, 2018 we organised a policy roundtable at Utrecht University on the effects of industrial diversification and entrepreneurship on regional growth in the EU. The roundtable offered an excellent setting for the FIRES participants to share and discuss their research findings with practitioners involved in regional policy making and with researchers with an expertise in policy design, content and evaluation. An initial round of presentations of empirical results was followed by a series of reflections by policy makers, who provided critical assessments of our findings and discussed how and to what extent contemporary policies can benefit from the results. In a third round of presentations, several policy researchers provided critical evaluations of our empirical findings and linked our research to contemporary debates on the nature and design of policies aimed at the promotion of regional growth. Overall, the participants were in agreement that there is much scope for policy making to foster regional growth by promoting regional entrepreneurship. Also, policies should try to focus more on positive growth effects that the type of composition of economic activities of regional economies can generate. There was also consensus on the need to allow for substantial heterogeneity in the design and content of policies, given structural differences between lagging and advanced regions in the EU and dynamic differences between regional growth trajectories based on related or unrelated diversification of economic activities. The present roundtable was held on March the 12th, 2018 in Lisbon, at the Economics and Management School from U. Lisboa. 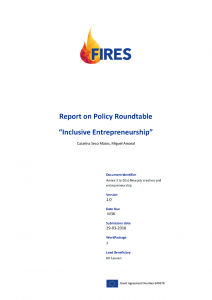 The aim of the workshop was to of discuss some of the reforms oriented towards inclusive entrepreneurship that emerged from the research developed within the FIRES Project. The panel included reputed academics, entrepreneurs, and policy makers. Some of the key ideas generated and discussed at the workshop can be summarized as follows: (i) self-employment is a relevant occupation for individuals even if entrepreneurs are not employers (creating other jobs); (ii) it is important to alleviate the effects of unemployment, to prolong individuals working life if they are willing to, and to guarantee the existence of meaningful modes of occupation with monetary and non-monetary rewards; (ii) knowledge acquisition should be promoted throughout individuals lives so that it can be viewed as an asset rather than a liability (human capital depreciation). 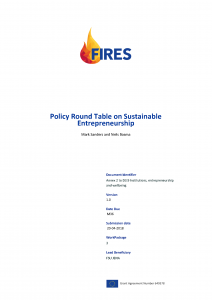 In this round table we discussed three of the most extreme policy proposals in the FIRES-longlist of possible interventions to strengthen the entrepreneurial ecosystem. Participants discussed reforms in (i) the patent and IP institutions; (ii) the introduction of digital central bank currency; and (ii) experimentation with a universal basic income. All three proposed reforms were presented as ways to strengthen entrepreneurship in general, but at the same time zoomed in on aspects of sustainability and inclusion. The participants were quite positive on the proposals. Some had some reservations with the role of banks in the entrepreneurial ecosystem, and some took a more nuanced approach to IP, but generally the participants agreed that the proposals made sense and would possibly promote a more entrepreneurial society in Europe. The distance to the more direct and traditional tools of entrepreneurship policy was explicitly recognized, but also appreciated. The participants also advised the project team to use this setup in Brussels with the policy makers there. They liked the “hackathon” type approach to formulating more encompassing reform proposals. 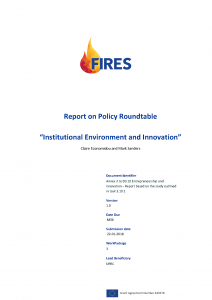 On January 19th, 2018 we convened a small expert policy makers workshop at the University of Piraeus to discuss the FIRES-proposed reforms to strengthen the institutional framework for innovative entrepreneurship in Greece. The discussion revolved around proposals to reform intellectual property rights, knowledge generation and R&D and universities. Participants shared their concerns, reservations and support for the relevant proposals and discussed amongst themselves and with the consortium the political desirability and feasibility of the different proposals. In general, there was broad support for the proposed reforms and the underlying common philosophy. Participants agreed that knowledge generation is costly and important and requires both incentives and adequate funding. Once available, however, knowledge is a non-rival public good and efficiency dictates it should be diffused to all at zero cost. Furthermore, participants agreed that commercialization is an important channel for diffusion. Rome, 05-03-2018, 14:30-17:30, Cassa Deposito e Prestiti (CDP), Rome, Italy. Would you agree with our approach? Would you agree with our diagnosis? Would you agree with the proposed treatment? a) Which proposal(s) among the ones proposed by FIRES, you would support and endorse and, conversely, which one (if any), you would disregard? 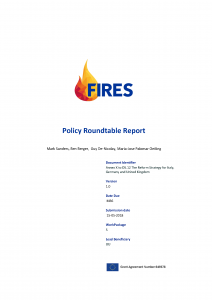 b) Is there any policy proposal for the Italian entrepreneurial ecosystem that you would recommend to include that it is not mentioned in the FIRES policy brief? c) Can you please gauge about the political feasibility of the FIRES proposal(s) that you like. Are they easily implementable or not? Do you see any difficulties or obstacles of any sort, and in particular political obstacles, to implementing the proposed recommendation(s)? Berlin, 24-04-2018, 11:00-16:00, Bundesministerium Fuer Wirtschaft und Energie, Berlin, Germany. London, 26-04-2018, 11:30-16:00, London School of Economics, London, United Kingdom.